Solutions Tricks How to display Hindi fonts properly in Window Vista, XP, 2000, 98 and Machintosh, LInux. How to display Hindi fonts properly in Window Vista, XP, 2000, 98 and Machintosh, LInux. If you are not able to read the Hindi content properly please follow the following steps. This will prompt you to insert XP CD. Insert the CD and repeat the process. Allow the system to copy necessary files. Restart the system. Now you will be able to read the Hindi content on IE, FireFox and Opera. If you see boxes, circles or junk characters instead of Hindi fonts, or Hindi content but 'ottakshara' not displayed correctly follow Step 1. 1) Download Akshar and paste in FONTS folder. Once you install the font and restart the system. Even now if you can't read Hindi content properly then you can enable indic support. To do that follow Step 2. The above steps should fix the problem. If it still doesn't, please write comment us with the browser version, OS version and the problem you are facing. It would help us if you can send a snapshot of the characters which are not correct. Please follow the instructions below to take a snapshot. - Open the page which has the problem. - Press 'Print Screen' key on the keyboard. - Open a Word processing software like Word and paste (Control-V) the snapshot. - Save the file and send it to us. Copy one of the Hindi fonts file from Hindi Fonts (we recommend Akshar font) to .fonts directory in the user's home directory. If .fonts directory does not exist in the home directory, please create it. Finally run the command 'fc-cache' from the command prompt. It is very important to restart the browser, only then you will be able to read the content in Hindi. 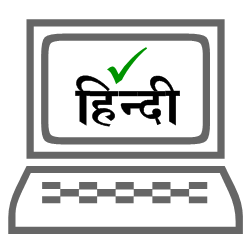 Mac : Additional fonts and language kits are required for customers to view web pages in Hindi. For font download packages and detailed installation instructions visit: http://salrc.uchicago.edu/resources/fonts/available/hindi/#mac. We recommend Users to use Mac OS X 10.4 and Safari 2.0 to view the Unicode fonts without trouble. 1. Type 'about:config' in mini address bar. This opens configuration settings. 2. There is a option for use bitmap fonts. Change that to Yes. 16 June 2018 at 20:53 × This comment has been removed by a blog administrator. 12 July 2018 at 14:59 × This comment has been removed by a blog administrator.